Attendance … Every Day Counts! Please make sure that your child is at school ON TIME every day that they are well. Please avoid taking children out of school for holidays, shopping days, birthdays and ‘just because’ days. Every single day that children are absent from school affects their learning, their friendships, their relationships with their teacher and class and their connectedness to school. If your child has missed 5 days or less this semester – This will support your child to achieve their best at school – academically and personally. If your child has missed more than 10 days this semester – The amount of time your child is missing will impact on their learning and their friendships. If your child has missed more than 15 days this semester – Your child is missing so much time from school that it will be extremely difficult for them to keep up with their learning, their friendships and to feel connected to school. 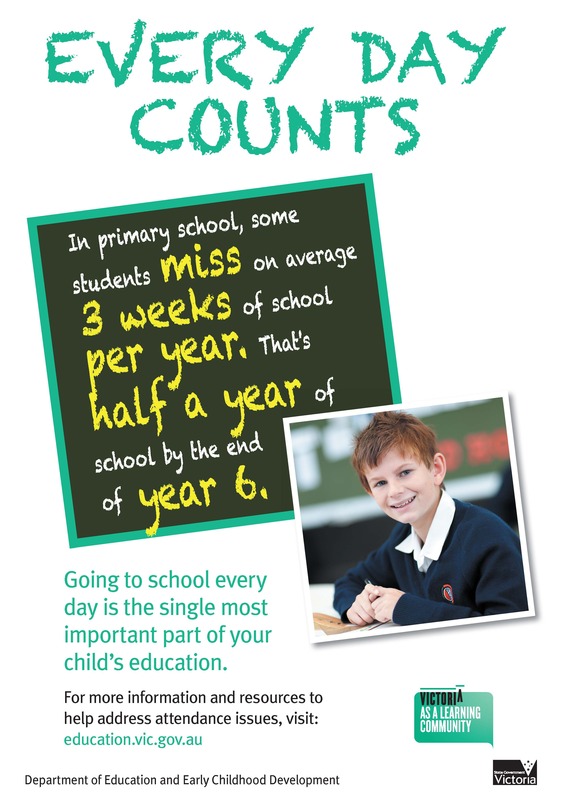 For further information about the Department of Education’s Every Day Counts initiative, please click here.